"Some stars get the boot when their companion star explodes in a supernova, and others can get kicked out of crowded star clusters," said astronomer William Chick from the University of Wyoming in Laramie, who presented his team's new results at the American Astronomical Society meeting in Kissimmee, Florida. "The gravitational boost increases a star's speed relative to other stars." "We are using the bow shocks to find massive and/or runaway stars," said astronomer Henry "Chip" Kobulnicky, also from the University of Wyoming. "The bow shocks are new laboratories for studying massive stars and answering questions about the fate and evolution of these stars." 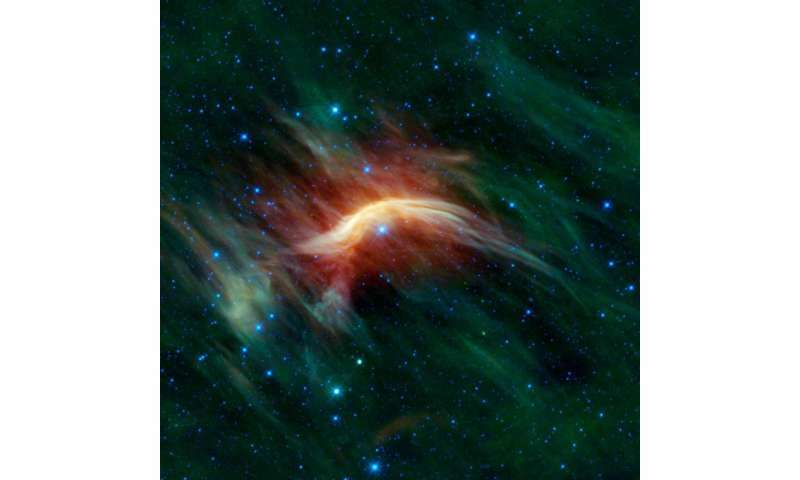 "WISE and Spitzer have given us the best images of bow shocks so far," said Peri. "In many cases, bow shocks that looked very diffuse before, can now be resolved, and, moreover, we can see some new details of the structures." Some of the first bow shocks from runaway stars were identified in the 1980s by David Van Buren of NASA's Jet Propulsion Laboratory in Pasadena, California. He and his colleagues found them using infrared data from the Infrared Astronomical Satellite (IRAS), a predecessor to WISE that scanned the whole infrared sky in 1983. Maybe warp signatures will be similar to this......? Comments? Being very rare & Very powerful may be consistent with aftermath of a craft (accelerating long enough so its relativistic speed is very high) colliding with debris. Re Special Relativity & assuming the craft could sustain high g for long enough (re occupants/robots ref frame) its accumulated relativistic KE would be Immense ! Does the material that is forming the bow shock, show up in any other way? Hmm, similar thought occurred to me however, although I accept DM as an algebraic place holder for missing gravitational effect, I'm not discounting an aspect of the n-body problem (over time) & in relation to Integral of all other energy sources of a 'shifted form'. Is it calculated into galactic mass measurements? I guess what I'm saying is... is it visible to any other instruments? Is it just sparsely distributed standard matter that is experiencing friction heat from being jammed together by the (magnetic field of the?) fast moving star...? I guess what I'm saying is... is it visible to any other instruments? Is it just sparsely distributed standard matter that is experiencing friction heat from being jammed together by the (magnetic field of the?) fast moving star...? So the committed merger maniac must conclude that these massive speedy stars are growing smaller as they expel matter. And he must conclude that they previously grew from accretion when they were idle, and somehow later likely got the boot from a much more massive companion disintegrating. Do we see many binary systems with both very massive stars? Even in a cluster, how likely is it that two stars come close enough to cause such a considerable boot? In the alternative, what if the runaway star simply grows by itself over time from within, eventually growing large and active enough to develop the bow shocks observed? Heresy: 1. opinion or doctrine at variance with the orthodox or accepted doctrine, especially of a church or religious system. Nope, because (if we posit Alcbierre style warp drives) space gets stretched back to normal once the bubble passes. Stuff would look the same afterwards. you'd only see a very (VERY), short 'blip' of distortion - like a gravity lensing effect - when the warp driven entity passes. And you'd see that in a line with the direction of travel, not a bowshock formation. Does the material that is forming the bow shock, show up in any other way? Is it calculated into galactic mass measurements? Since those regions average out with lower density regions behind the star I think no adjustment is needed. Dark matter interacts only very little with ordinary matter (in all theories that are currently in the mix) so detecting it via bow shock isn't easy. DM concentrations might deform a bow shock, but only if they are very local. You are not making sense, which is a necessary condition to be a heretic.